feature independent front and rear crossovers. For instance this means you can run set the front channels on "high pass" to run full range speakers and the rear channels on "low pass" to run subwoofers. 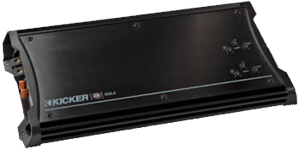 All Kicker 4 channels amps are CEA compliant which means if you purchase a 350 watt amplifier, that's exactly what you will receive!